The Da Shan Dynasty part 7: Down With The Da Shan Dynasty! Several of my students don’t know or have already forgotten who Zhao Ziyang was. But they have all heard of Da Shan. Da Shan is ‘China’s favourite foreigner’, renowned in every corner of the Middle Kingdom for his dashing good looks and his complete mastery of the Mandarin Chinese of Beijing. He arrived here from Canada in 1988, and since then, according to his very informative webs…excuse me just a moment, one of the students has a question. Yes, you there, you had a question? Don’t call me sir. My name’s Richard. What’s your name again? Jamily? Your name is Jamily?!? What’s your question, Jamily? Oscar Wilde, Jamily. What about it? Don’t say ‘what, sir?’ It’s … oh it doesn’t matter. What’s your point, Jamily? No, I mean it’s preposterous. It’s one of the stupidest things I’ve ever heard in my life. 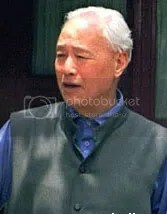 Jamily, I never said that Zhao Ziyang was gay! Jamily! This is just too silly for words. Sit Down! Stop calling me Sir! Just a moment. I need to think. You know, maybe that kid Jamily – Jamily! – has a point. It does kind of all make sense. Right! I’ve thought about it. It’s time for the Chinese people to stand up once again! Down With The Da Shan Dynasty!!! It’s time to establish a People’s Republic of China! Next Post What are we all doing here?